Even though I am paid to develop recipes for a profession, and I do plenty of ‘concocting’ in the kitchen, and make a plethora of ‘recipes’ without a recipe, I usually always thoroughly read a recipe when I stumble upon one that interests me. That’s why I was absolutely shocked when I went to make this chicken curry recipe from the MOM. You see the whole reason I chose this recipe was based on the fact that it was a slow cooker recipe (you know how much I love to utilize my slow cooker especially during busy times like I have had recently). I put this recipe on my weekly menu plan and got all the groceries at that week’s shopping excursion. Then the day that I had this scheduled for dinner I completely disregarded the whole slow cooker thing. I went to make dinner, pulled out the recipe and was completely dumbstruck. It was nearing 5 o’clock and there was no way that this meal could be made in the crock-pot and I did not have another back up dinner option. How could I have forgotten that this was to be made in the crock-pot. Well needless to say dinner needed to be made and chicken curry was for dinner. So I still made the recipe and adapted it to be made on the stove top. This dinner actually came together very quickly because I had leftover shredded chicken in the fridge (that when I made the chicken a couple of days earlier had planned on using for this specific recipe, still not thinking that it was a slow cooker recipe) and also had leftover rice on hand. Don’t you just love when meals come together that quickly! So instead of slow cooked chicken curry I bring you quick cooked chicken curry. This dish was full of authentic flavors. It smelled wonderful as it cooked (and as I took the pictures, man maybe one day we will have smell-o-computers). (Forewarned a smell that lingers!) : ) So if you are looking a super speedy dinner this one is for you! In a medium sauce pan over medium heat, whisk together the tomato paste, garlic, curry powder, ginger, cumin, and chicken broth. Let sauce simmer 5 minutes. After simmering, remove from heat and stir in yogurt. In a large sauté pan heat the olive oil. Add the onion and stir to combine. Stir in the frozen vegetables and cook for 3-4 minutes. 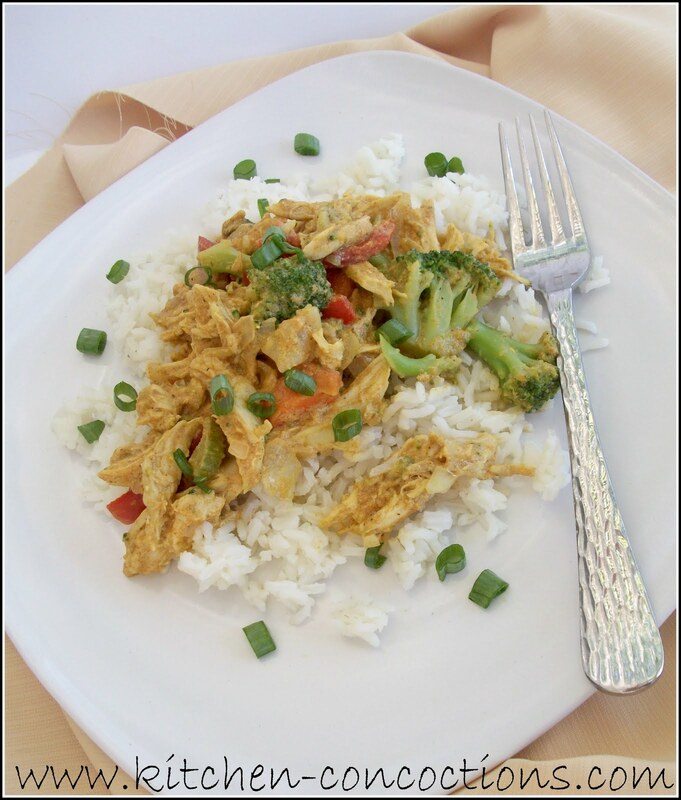 Stir in chicken and curry sauce. Simmer for an additional 5 minutes or until heated through. Season with salt and pepper if needed. Serve chicken and vegetable mixture over rice.